:Maybe God isn't who you think He is. Maybe He's much better. Pastor and speaker Shane Pruitt guides readers in identifying the Christian cliches we've all heard that are actually unbiblical lies. He then counters with the truths about God as presented in the Bible, truths that bring encouragement and freedom for our lives. 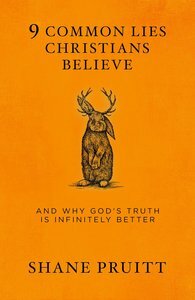 About "9 Common Lies Christians Believe: And Why God's Truth is Infinitely Better"
SHANE PRUITT and his wife, Kasi, live in Rockwall, Texas, with their five children. He has been in ministry for over 17 years as a denominational leader, church planter, pastor, and traveling communicator. He currently serves as Director of Evangelism for the Southern Baptists of Texas Convention. He holds a Bachelor's in Biblical Studies, a Master's in History, and a PhD in Clinical Christian Counseling. He is a popular blogger, and has had articles appear in RELEVANT, Christianity Today, The Christian Post, CrossWalk, Church Leaders, The Baptist Press, FaithIt, HelloChristian, and many others. Shane and his wife were featured as ABC's Nightly News "Persons of the Week" in August 2017 - the story centered around their adoption.